This post is a bit different from my usual subject matter here, but I figure it is likely to be of interest to at least a few of my readers. I was up in Farmington a few days ago and ate at Ashkii’s Navajo Grill. I remember reading about this place when it opened a few months ago and being intrigued by the idea. Basically, it’s a Navajo-owned restaurant serving Navajo cuisine to a Navajo clientele. 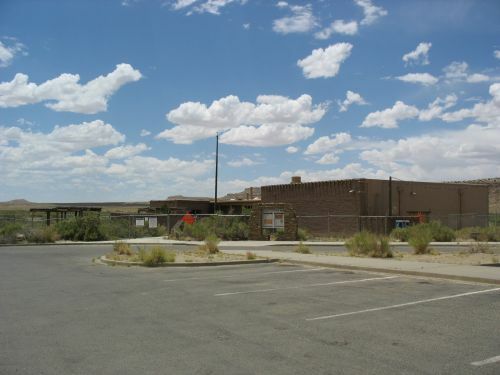 There are very few Navajo restaurants anywhere; I think I recall hearing about another one in Phoenix, and this Navajo Times article about Ashkii’s mentions one at the Farmington Indian Center, but those are the only other examples I can think of. There may be a few others, but it’s definitely not a prominent culinary niche anywhere. 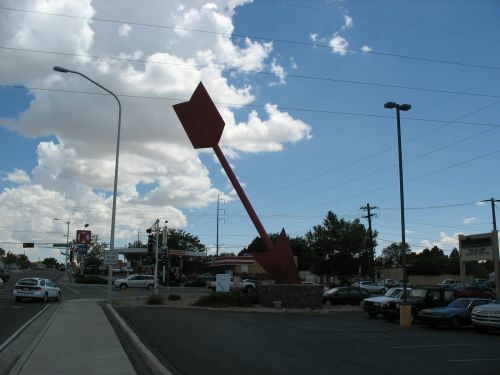 There are restaurants in the various reservation border towns that serve some Navajo dishes, but these are typically aimed at curious tourists who don’t know anything about Navajo food, and the resemblance to the sort of food that would be served in a true Navajo context varies considerably. The interesting thing about Ashkii’s is that it is explicitly targeting a Navajo clientele, and the food is therefore made to suit Navajo tastes rather than Anglo ones. It’s been quite successful too, both in terms of the authenticity of the food and the amount of demand for it among the Navajo community in Farmington. The place was almost empty when I went there, but that was at about 2:00 pm on a weekday, not a busy time for restaurants in general. The decor is quite stylish and pleasant, and the food is indeed very authentic. I ordered a Navajo taco, since I figured it would be good to go for something very standard and traditional. It was very much the sort of Navajo taco that would be on offer at an event on the reservation rather than the kind many off-reservation restaurants offer. Mexican restaurants in particular often do their “Navajo tacos” basically the same way they do the rest of their food, with ground beef and beans smothered in melted cheese and chile sauce, the only difference being the use of frybread rather than a tortilla or sopaipilla underneath it all. This Navajo taco, however, had roast mutton rather than ground beef mixed in with the beans, shredded cheese, and raw lettuce, tomatoes, and onions piled on top. It comes with optional green chile, which I ordered and which turned out to consist of a whole roasted green chile placed on top (rather than chopped up in a sauce, which would be typical at a Mexican restaurant). It was very much a real Navajo taco, which was actually somewhat unfortunate for me since I don’t like real Navajo tacos that much and prefer the more bastardized versions attuned to Anglo or Hispanic tastes. If I went there again I think I would order something different. The menu is small, and consists entirely of dishes popular among Navajos, but the quality of the ingredients used is clearly high enough that I’m sure I could find something I liked better than a Navajo taco. 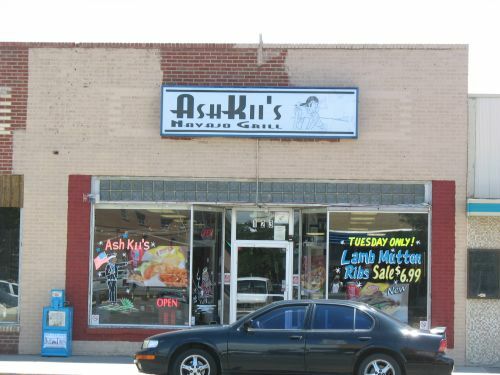 I definitely recommend Ashkii’s to anyone familiar with Navajo cuisine, and it would also be suitable for visitors looking for an exotic, “authentic” taste of the Southwest. 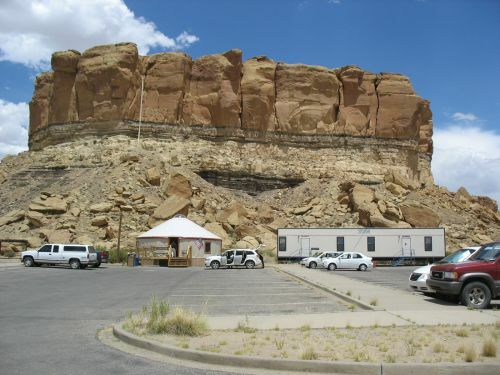 Be forewarned, however, that this is very much a Navajo restaurant for Navajos rather than for tourists, and anyone who is not familiar with Navajo food should be cautious about what to order. In general, Navajo cuisine is very heavy and meat-based, and often rather bland. Although some dishes are derived from Mexican prototypes, the cuisine as a whole actually doesn’t resemble Mexican food very much. With that warning in mind, however, Ashkii’s is definitely an experience worth having. 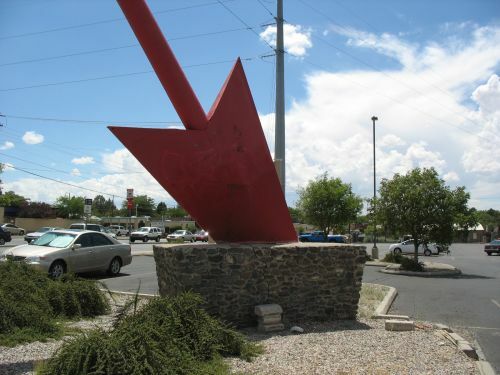 It’s located on Broadway in downtown Farmington, a part of town that I’ve noticed is becoming more and more Navajo-oriented recently, a noteworthy development given Farmington’s long history of being very much a white man’s town. It seems like the increasing tendency toward urbanization among Navajos is starting to have noticeable effects even in Farmington, as the growing Navajo population in town leads to more demand for Navajo-oriented businesses like Ashkii’s. I could say more about this trend, but this post is really just intended as a restaurant review, so I’ll leave that for some other time. 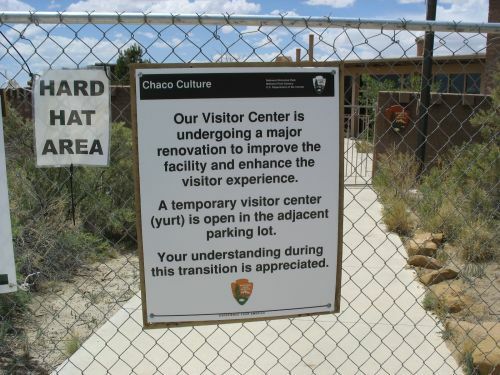 When I left Chaco last summer, plans were underway to do a major renovation of the visitor center. The idea was to leave the exterior alone, apparently because it was considered of historical value as part of the Mission 66 program, but almost totally redo the inside, rearranging the office space and most of the visitor center functions to use the space more efficiently. Only the museum was going to be left as it was. I thought this was basically a good idea, since the way the building was laid out at the time was noticeably suboptimal. 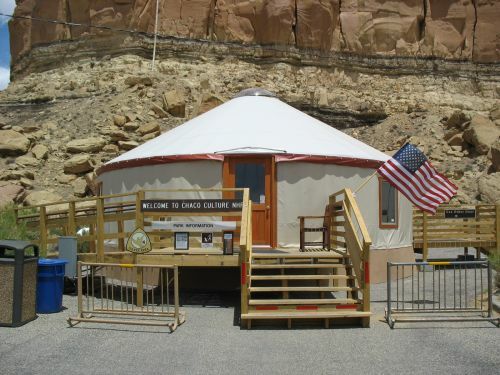 The project was supposed to take a few months, and while it was underway the offices were to be moved to a series of trailers and the visitor services were to be put in a yurt to be constructed in the visitor center parking lot. 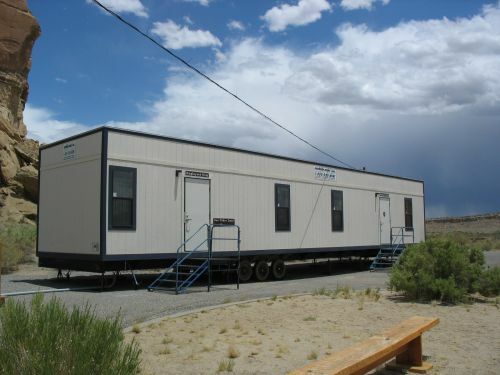 Work began this March, and the movement into the trailers and the yurt was apparently smooth, but about three weeks in it became apparent that the building was structurally unsound and that just redoing the inside was not going to be a feasible option. Apparently when the building was originally constructed in the 1950s nobody really checked to make sure the ground underneath it was stable, and it turned out it wasn’t and had been eroding away over time. There had been indications of something like this over the years, and some cosmetic alterations had been done to continue using the building, but by now it was clear that the only realistic option was to tear the building down entirely. Since the park still wants to move forward with the renovation plan, under which any new work must be within the footprint of the original building, the next step after demolition will be construction of a new building on the same spot, with engineered soil brought in first to ensure that the ground is stable this time. Right now the decision has apparently been made that the old building will be demolished, but plans for what to replace it with are still being formulated by the architects. So it looks like we’ll be in the yurt and the trailers for quite a while now; people have been saying at least a year, but I’m thinking it’ll probably be more like two. That’s okay with me, actually, since the yurt is quite nice and I don’t mind working in it. I’m only here for the summer, of course, and it remains to be seen how comfortable the yurt will be when winter comes. Lots of visitors, seeing the boarded-up and fenced-off visitor center, have been asking what’s going on. When I tell them, they often respond with a knowing chuckle. People seem to understand that these things happen. Some are a bit disappointed that we no longer have a museum to show any artifacts or an auditorium to show the park video, but even they are pretty understanding of the situation. I’ve heard considerably more positive comments about the yurt than negative comments about the closed visitor center, in fact. This is a marked contrast to the amount of outrage people showed when the campground was closed. Luckily it’s now open, so at least that nightmare is over. Just goes to show what the priorities of visitors to Chaco are, I guess. In comments to the previous post ben asked about the use of dogs as draft animals. 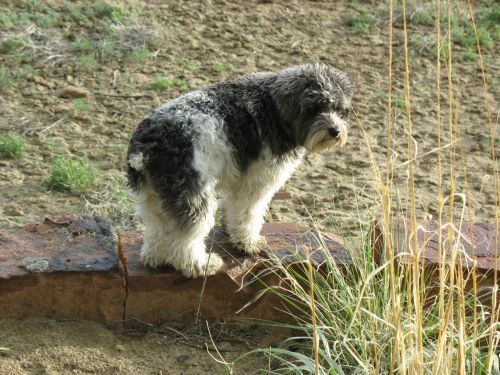 I replied that they were so used in conjunction with the travois, especially on the Plains, but that the dogs in the Southwest and in Mesoamerica were smaller than Plains dogs and not able to pull any substantial loads. This reminded me that I’ve never done a post on dogs, and that I probably should. The only domesticated animals the Chacoans and other prehistoric Southwestern peoples had were dogs and turkeys. The first detailed study of Southwestern dogs, and the only one I am aware of, was done by Harold Colton of the Museum of Northern Arizona and published in 1970. This paper is one of the earliest examples of the use of statistics in Southwestern archaeology. Colton used statistical techniques to compare various measurements of dog remains from various parts of the Southwest and various time periods. It isn’t clear if any of his 110 specimens came from Chaco, but it appears that none did. This is unsurprising given that he mostly used specimens in the MNA collections, which contain little Chacoan material. Nevertheless, his sample includes most parts of the Southwest and most periods, so it is reasonable to presume that any generalizations about Southwestern dogs resulting from it can be applied to Chaco as well. The specific statistical techniques Colton used are rather different from those commonly used in archaeological publications today, and as a result I have a hard time evaluating them. Nevertheless, some of the patterns he found seem clear. Briefly, the early specimens, dating before AD 800, were all small, and some lacked the first premolar on the lower jaw. After 800, however, a second type of dog, larger and never missing the first premolar, appeared, first in the Rio Grande Valley and later further west. It is not clear from the presented data when the large dog would have reached the Chaco area, but I suspect it would not have been until after the main florescence of Chaco between AD 1030 and AD 1130. This distribution in time and space suggests that the larger dog was introduced from the Plains, where large dogs are known from early on. These large dogs apparently interbred with the small dogs, as the average size of the small dogs increased over time beginning at the time of the introduction of the large dogs. Colton’s sample size was small and his conclusions tentative, but some interesting patterns emerge nevertheless. I think the most interesting is the rather early introduction of small dogs to the Rio Grande Valley, which suggests substantial contact with the Plains as early as AD 800. Considerable Plains-Pueblo contact is known for the later period, starting around AD 1325, when massive immigration into the Rio Grande area from other parts of the Pueblo world substantially shifted the geographic distribution of Pueblo peoples, but before that the Rio Grande Valley was sparsely populated and relatively little is known about it. The introduction of the large dogs, however, suggests that Plains contacts were of longstanding importance in the region, and that the intensified contacts after 1325 may have been the result of the increased population rather than a change in the basic structure of regional relationships. Other evidence for the early importance of contact between the eastern Pueblos and the Plains comes from the discovery that domesticated turkeys in the Southwest were genetically closer to subspecies of wild turkey found further east than to the local subspecies. In light of this evidence, I’ll modify my response to ben to say that the dogs available to the Chacoans probably would not have been suitable for pulling loads, but that it is possible that the large Plains dog was already available in Chacoan times. There’s no evidence that I know of, however, that dogs were used as beasts of burden in the Southwest at any point in prehistory. I’ll look for more recent studies on the issue of Southwestern dogs to see if I can get more information. I don’t know of any such studies, but there may well be some. I think it’s actually not difficult to see why the Chacoans wouldn’t have seen any use for the wheel even if they somehow knew about it, and the lack of draft animals is the key to understanding why. (This is admittedly a bit speculative on my part, but I think it works.) Without big, strong animals to pull wheeled vehicles, any efficiency gains from them in terms of human labor would be decidedly non-obvious. The only type of wheeled vehicle that would really be effective using only human labor would be the wheelbarrow, and while this may provide some efficiency gains over carrying goods by hand I don’t think they would have been clear enough to compensate for the increased effort involved in building the thing, especially given the often rough and broken terrain of the Southwest. 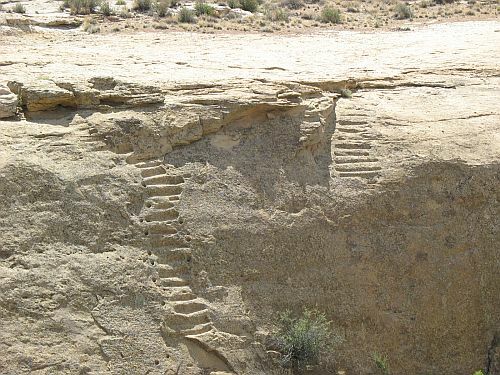 Even the Chacoan roads, which may or may not have actually been intended for use in transporting goods but certainly could have been so used once they were built, were actually not as level and easy as people often assume, although they were more level than the surrounding terrain. Most of the effort put into the roads went into clearing the surface and defining the curbs, but grading of the cleared ground surface was typically not done and the road beds follow the underlying terrain for the most part. This was fine for foot traffic, and definitely an improvement over the uncleared surrounding terrain, but it wouldn’t have been particularly suitable for wheeled vehicles. Furthermore, the vaunted straightness of the roads would actually have made them even less suitable for wheeled vehicles or draft animals, given the common practice of handling steep cliffs in the path of the road with stairways. Good luck getting a cart up or down one of those! The lack of draft animals and the unevenness of the terrain have also been posited as reasons for the lack of wheeled vehicles throughout the Americas. While the terrain would not have been an impediment everywhere, such as in the Yucatan where the terrain is generally flat and the roads built by the Maya were much more elaborate and level than anything seen around Chaco, in highland areas like Central Mexico and lowland areas covered by dense vegetation such as those along the Gulf Coast of Mexico the maneuverability of a person on foot would likely have been far more important to efficient transportation than any increase in efficiency resulting from wheeled vehicles in the absence of animals to pull them. Gordon Ekholm of the American Museum of Natural History, whom we last saw discovering atlatl finger loops, discussed many of these issues in an interesting article from 1946 about the wheeled toys found in various parts of Mexico, which demonstrate that at least the Mesoamericans were in fact aware of the wheel even though they didn’t use it for any practical purpose. These clay toys, in the form of animals with wheels in place of feet, had been found in widely scattered parts of Central and Northeast Mexico, from Oaxaca to Veracruz, and while the axles connecting the wheels to the feet were apparently made of a perishable material like wood and did not survive, the fact that one example was found in situ with the wheels in the proper position led Ekholm to conclude that they definitely were originally wheeled. Robert Lister (a very prominent figure in the history of Chacoan archaeology who also did some work in Mesoamerica) followed up on Ekholm’s article shortly afterward, noting the apparent presence of similar wheeled toys in West Mexico and referring to the discovery of copper examples in Panama as well. Ekholm’s article provides a solid discussion of the implication of these toys for Mesoamerican technology and general anthropological understanding of technological development. 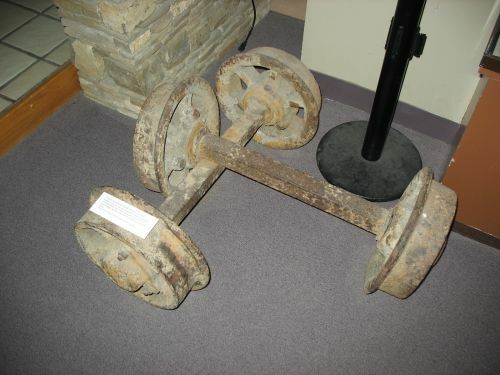 He discusses the lack of draft animals and the difficult terrain, but ultimately concludes that the main factor preventing more widespread use of the wheel was likely a cultural and technological conservatism that privileged the old way of doing things, which in this case meant carrying goods on people’s backs, over an untried new invention like the wheel. He attributes the origin of the idea of wheeled toys to pure invention, probably stemming from experimentation with the round spindle whorls that are very common Mesoamerican artifacts. 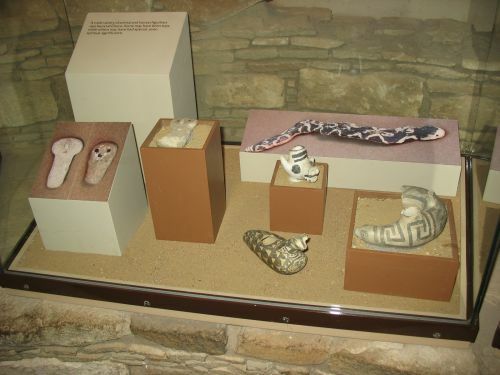 It’s not clear just how far this idea spread, and to my knowledge there is no evidence that anyone in the Southwest was aware of it, although some of the ceramic animal effigies found at Chaco and elsewhere do bear some resemblance to the Mesoamerican toys. Ekholm makes a convincing case that despite the ingenious nature of these toys, without suitable social and ecological conditions for the wider adoption of the technology it remained more of a curiosity than anything else. Basically, without draft animals, the idea of making a big vehicle like a cart which could carry a heavy load more efficiently than a person could would be unlikely to have occurred to anyone, because such a cart would still have to be pulled by people. Or, in other words, if you have a cart but not a horse, you are, well, putting the cart before the horse. And who would do a thing like that? In comments to the previous post, pato’ links to a recent press release on the discovery of an atlatl dart in a melting ice patch near Yellowstone. This type of discovery is becoming more common as global warming causes ice patches and glaciers to melt at an unprecedented rate, releasing artifacts that have been frozen in them for centuries or millennia. Because of the protective qualities of the ice, artifacts made of perishable materials like wood like atlatls and darts often survive there. These discoveries are particularly helpful for the study of hunting paraphernalia, because many of the artifacts in the ice got there when they were lost during hunting expeditions in harsh territory that would have been unsuitable for permanent or temporary habitation. Quentin Mackie has a good discussion of this find and ice patch archaeology in general in which he links to an earlier post of his discussing a much earlier find from British Columbia. That find was a projectile, made of wood with attached stone point, found by a surveyor near Tsitsutl Peak in 1924. It was mentioned briefly in news reports at the time, then disappeared into the collections of the Royal British Columbia Museum until it was rediscovered by a curator there who did some testing of it that was published in 2005. Radiocarbon dating of the wood came up with a 2-sigma calibrated range of AD 1482 to 1639. An unsuccessful attempt was made to date a sample of the sinew used to haft the point to the shaft as well. This is quite late, and it suggest that the weapon is an arrow rather than an atlatl dart, as the bow and arrow would certainly have been introduced by that time and the general thinking in this region is that the atlatl was no longer in use then. The problem with this conclusion in this case, however, is that the thing is huge. Including the point, it’s 89.5 cm long and broken at the end, indicating that it was originally even longer. The shaft alone (excluding the point) is 86.2 cm long. Recent ice patch finds from the Yukon, discussed by the authors of the paper as a comparative context for the Tsitsutl artifact, show that late prehistoric arrows have shafts ranging in length from 52 to 73 cm, all much smaller. Atlatl darts from the Yukon are larger, and some are around the same size as the Tsitstul artifact, which the authors estimate to have probably been about 120 cm long originally. Comparison to some other methods for determining if a point came from an arrow or a dart reveals that the Tsitsutl point doesn’t exactly match either the dart or arrow point characteristics, but in most size attributes it is closer to the dart side. There is also some ethnographic and ethnohistoric evidence of atlatl use in the contact period on the northern Northwest coast, including an eyewitness account of atlatl use in maritime hunting among the Tlingit in 1788 and a few Tlingit atlatls from the eighteenth and nineteenth centuries in museum ethnographic collections. Tsitsutl Peak is not in ethnographic Tlingit territory, but it isn’t very far away and certainly part of the same general cultural area. The Tsitsutl artifact is also made of yew, which was not a common type of wood used for arrows ethnographically. Now, I look at that evidence and conclude that this is probably an atlatl dart, and that it therefore suggests that the atlatl was in use in this area for longer than archaeologists have generally thought. Perhaps, as in the Arctic, the atlatl was used primarily for maritime hunting while the bow and arrow was used on land, although the fact that this artifact came from an inland setting is problematic for that theory. Oddly, however, the authors of the paper analyzing it conclude that it must be considered an arrow, apparently based almost entirely on the late date and a supposed resemblance in form to arrows and lack of resemblance to known atlatl darts (which are of course much older). They even say that the late date on the wood is so reliable that it doesn’t matter that the attempt to date the sinew failed! In this circumstance, where the dating doesn’t clearly match the expected form of the artifact, I would say that it would be particularly important to get as many dates as possible. They don’t really explain why they don’t find the similarity in size to known atlatl darts and the ethnohistoric evidence convincing. Certainly there are problems with classifying weapons as darts or arrows based solely on size, an issue that I’ll discuss in a later post, but the size difference between the two is pretty well established ethnographically and archaeologically and I think they should have at least acknowledged that and explained their reasoning in making their conclusion contrary to that line of evidence. While some aspects of the paper’s discussion strike me as dubious, this is an important find, and it’s good to see it published after languishing in obscurity for so long. Ice patch archaeology has a lot of potential for improving our understanding of the past, but that potential can only be realized if the stuff is collected, studied, and published.